A few weeks ago while rummaging through the Mojave, dumb luck delivered me to an odd spot. 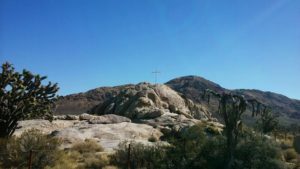 Somewhere amid the desert’s Joshua trees rather than near habitation I saw a simple cross stark against the sky upon a granite outcropping. This was a World War I monument. One-hundred years ago on November 11th, the Armistice which silenced World War I commenced at 11 o’clock. One expects to come across rattlesnakes in the desert. In fact there are signs which tell hikers to keep their eyes peeled, if not ears opened, for them. Really? Have we become so numb warnings must be placed to avoid rattlesnakes? Rattlers? Yes. Symbolism referencing industrial scale death and destruction? No. Posted information about the cross briskly mentioned who it commemorated. The memorial honored area men who’d served and been sacrificed during the Great War. Then, it would’ve been “the Great War.” When first erected in 1934 who could’ve envisioned even worse carnage rending civilization five years later? 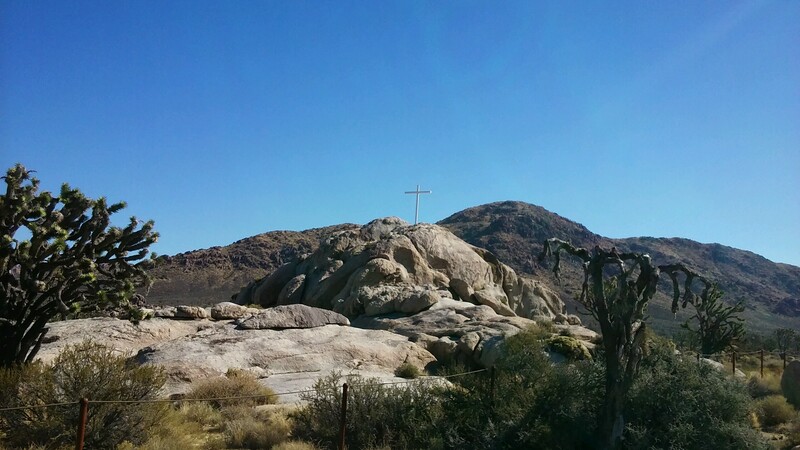 Known officially as the Mojave Memorial Cross, this tribute has had a fraught 21st century history. As we get more sophisticated our methods of honoring the valiant becomes more problematic. When first erected I guarantee none of those dedicating it thought the cross infringed upon the separation of church and state. This tribute is not akin to placing the Ten Commandments on public property or permanently affixing religious symbols in public schoolrooms. The cross was a gesture of gratitude. One intended to remind, perhaps make passersby notice and even give thanks we produce such people willing to answer calls which may demand their last measures. That this cross once stood on public land enflamed absolutists determined signs of faith and mortality never converge on government property. After theft and legal challenges bordering on farce, a common sense court decision transformed the land the symbol rose upon into a private entity. Learning the cross’ late history gave it a Chaplin-esque feeling, one I thought the men it honored may’ve certainly appreciated. Some might’ve known Chaplin through watching his earliest filmed slapstick. Innumerable as war monuments are in the United States, the Mojave Memorial Cross must be among the extreme few located in such a barren and remote spot. Back East, at least, ours call attention to themselves and the deeds of those commemorated by having been set along heavily traveled pedestrian paths. In parks, generally. There on plaques or steles or cenotaphs listing those who paid the ultimate prices. Of course there are exceptions. Here and abroad. One of New York City’s and the nation’s oldest pubs, McSorley’s displays an understated yet piercing acknowledgement of soldiers who didn’t return. Solidarity became an inconspicuous and easy to miss shrine. Before shipping out overseas, each soldier who frequented McSorley’s donated a wish bone. These the permittee strung above the bar. After the Armistice and demobilization, veterans came home and reclaimed their bones. The number of promissory items dwindled considerably yet enough remained unclaimed. They hang on exhibit today. Untouched for over a century, thick dust cakes them. Forever awaiting their rightful claimants, they continue reminding of freedom’s expense. In the smaller towns of France, observances expressing supreme thanks to local poilus who committed their lives in the nation’s defense conclude with reenactors reciting their names. This way for a brief instant heroes flare again. The last doughboy, the final American combatant who survived the War to End All Wars, died in 2011. Also gone are the combatants’ contemporaries, all sorts who knew them closely and intimately. Stories based on first-hand knowledge can momentarily revive the dead. Survivors’ memories could summon how sunlight colored the faces of enlistees and draftees while alive, the particular brightness of their smiles, the sound of voices long dispersed among breezes. Which soldiers left widows or “girls” behind who mourned them? There are relatives of such men still extant. However, they are generations apart from acquaintances having Great War experiences, either in combat or Stateside. Surely there remain countless diary entries, letters, and memoirs devoted to the subjects. However, inscribed words manage gilding where vocal reminiscences often deliver their yields raw. Writing, editing, and embellishment ease perfecting the story. Through our voices recall is seldom as neat. Unadorned as it is, isn’t spoken recollection all the more honest? The more vivid points usually leap forward during the telling, no? Like those recalling the Revolutionary War and Civil War dead or the Spanish-American War casualties, Great War markers hold a lot of surnames that would’ve been familiar among local residents for the longest. Before Americans discovered mobility, an ever more rapid pace of living, and immigration which diluted then subsumed families who’d resided in those particular patches of America since colonial days or before industrialization. There are names enshrined on now encrusted and neglected memorials whose successors have lost these ties to their pasts. History is tenuous. If we fail maintaining it we not only lose who we are but how we’ve come to where we’ve arrived. We open ourselves to revisionism. While it makes the past relatable to our era it warps understanding how those figures dealt with their circumstances. Doesn’t that only sweeten who we are by re- or misinterpreting the past in our favor? Doubtlessly in some nearby Mojave town’s historical society somewhere the names of those the cross commemorates are listed. But names alone only identify. They don’t form portraits. Who were the ranch hands and miners and shopkeepers and small tradesmen and just plain adventurers answering Woodrow Wilson’s plea to create a phalanx for democracy? Before President Wilson called them to duty how many bothered paying attention to the Old World bleeding itself white? During the early 20th century, Las Vegas sufficed as a rail junction and little more. Nipton, California, and Searchlight, Nevada, probably held what could’ve served as the nearest “bustling populations.” And those mostly reached via horses and buckboards. Then, the Union Pacific railroad regularly stopped in Nipton on the line between Los Angeles and Salt Lake. Searchlight businesses provisioned miners. Maybe in Kingman down across the Arizona line some streets were already paved and flivvers rattled along them. Yet during America’s Progressive Era, Kingman might as well have been San Francisco – and just as hard to reach. Isolated as these people were doesn’t it stand to reason proximity and virtual inescapability conferred upon them a sort of imposed familiarity we today might find intrusive? Going on a limb, they probably didn’t know any better. Did some of the area’s ranchers own gramophones? Forget that. How about upright pianos? Upon which rested the latest sheet music from Chicago, Kansas City, or even Gotham itself, New York City, waiting for the local virtuoso of the ivories to tickle them in accompaniment of homegrown “golden throated” vocalists. Wouldn’t parties beyond Nipton and Searchlight town limits, and for the ambitious, Kingman, have been the liveliest of social affairs? Bereft of our intense light pollution, using candles and lanterns that barely dented nebulous nights, the ceiling above luminous with stars must’ve convinced the gladly assembled below of the Almighty’s immensity. Since their mortal conscious incapable of boxing the heavens, who among the spectators below wasn’t just thankful? Even at night in 2018 when Sin City vanishes from the rearview mirror and the Mojave looms black beyond headlights, one succumbs to curious urges to pull off the well-traveled byway onto desert. There, dampening illumination to be enveloped in void barely simulates the general solitary sense of a century ago. At their parties, imagine the feasts prepared and eaten, the whiskey and beer poured, the conversations – loud, hissed, and whispered – as well as assignations rushed into then reconsidered, regretted or not, or likely looked forward towards repeating. Imagine the monotony broken. If the ranchers hired bands, which high-stepping party-goer had two left feet? Who swung his partner the liveliest? Which dancing pair of sweethearts moved in the sort of absolute harmony let them resemble a mythical “perfect couple”? What envies were left in the nights’ wakes? What jealousies were roused then further stoked? What enabled these selfless men to forsake these human conditions, this patch of Mojave, for the idea of saving the civilized world?